If you want to become an expert on Jalapeno peppers, this is the perfect gift pack you will like. You will taste the many different ways jalape�o peppers are applied as the main ingredient, for example, in hot sauces, salsas for dipping your chips, canned jalapeno chile peppers both as whole or sliced, and dips with cheese or with beans. 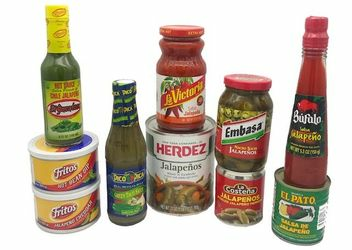 Si quieres ser mas experto en chiles, descubre las mejores variedades de jalape�os y sus aplicaciones en salsas de mesa (hot sauces), salsas para botanear con chips, chiles jalapenos enlatados y dips de frijoles refritos y queso con sabor a jalape�o.